Yes we're Crazy. Good crazy. You have to be when you live with a maelstrom of dogs vaulting off the furniture and a score of horses consuming tons of good, expensive alfalfa. 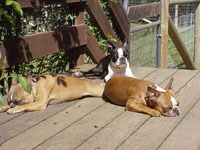 Living amoungst our animals' organized chaos has a way of keeping us grounded. Births do that. So do the occassional losses and all the raucous, inconvenient, wonderful lives imbetween. Now the nitty gritty: Lauren, the better half (I wrote this) is a full time veterinarian for Mendocino Animal Hospital in Ukiah, California. 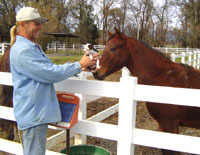 I graduated from UC Davis Vet School in 1986 . . .where did all the time go? In my career I have had the pleasure of pulling calves, spaying iguanas, and doing just about everything imbetween. My experiences have given me a keen intuition about animals, and sometimes people too. Mike, my hubby, is the service manager for Mydax, Inc, of Auburn California. He flys around the world trouble shooting issues with their industrial chillers for folks like Merck, Intel and the US Airforce. Fortunately he gets to stay home most of the time and manage the ranch while I work my long hours and pull emergency duty. Mike and I met, appropriately, at a veterinary clinic. His dog had dined on moldy garbage and I treated the inevitable dyspepsia. Mike still says I am the only woman he ever paid four hundred dollars to meet. Mike is a sweet, affable sort with a heart of gold. 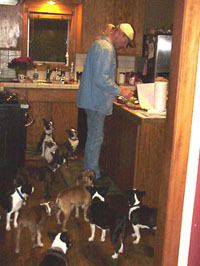 When he met me I had 2 bostons and 5 horses. The numbers have grown . . considerably. 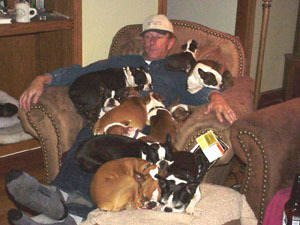 Every now and then I see a fleeting, puzzled expression sweep across his face as he ponders how life evolved, leaving him to watch TV with 11 bostons on his lap. The craziest thing we have ever done was to sell our lovely little turn key ranch in Newcastle California to move to a place that had "fixer upper" written all over it. That was in 2002. Moving 20 horses, 15 dogs and an indeterminate number of parakeets 180 miles was a major pain in the patootie. So was the 6 months in and out of escrow. Why do it, you ask? Well the reason was Potter Valley. For us, driving into Potter was like stumbling upon Tolkein's The Shire. Great oaks dripping with mossy beards lean over the Russian River as it meanders down the valley. 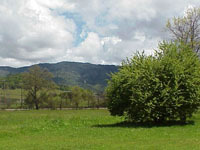 Vineyards and pear orchards bask in the fertility. And like Middle Earth, Potter hosts an interesting cast of characters. Ex-rocket scientists, 60's rock stars, vintners, rastafarians, witches and cowboys all call Potter Home. We were hooked the minute we drove into the valley. The great migration was on! 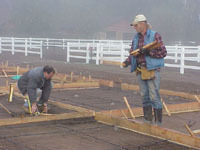 Ranches are a lot of work especially when you are building them nearly from scratch. Bare land calls for fences. It calls for barns. It calls for bigger loans. Mike and I have done most of the labor ourselves, taking pride in our accomplishements and, after a particularily grueling day, grumbling that we are getting to darn old for this. Then we soak our weary bods in the hot tub (after all, this is Mendocino County, one of the seats of hedonism in California). We are just now beginning to see the light at the end of the tunnel. A few more stalls, a few hundred feet of pipe corral and the major projects will be done! Want to see the ranch evolve? Click Our Virtual Ranch Tour. At any time during the tour, click on our logo to return to this page. It's not all work and no play. >We have made great friends here. Some wonderful wines are produced locally (I feel duty bound to act as quality control agent and test them regularily), and one of the best restaurants in Mendocino county resides in little ole' Potter. With the ranch work slowing down a bit, we are looking forward to doing more horse training or just dropping a fishing line in the river.In my odd spare moment I write cowboy poetry and sometimes sing in a local rock band. Mike is a science fiction enthusiast with a taste for offroading and, in his youth, surfing. And we both love our animals. Now we get back to the theme of what's important. We think honesty is important. Delivering on promises is important. Treating people and animals with kindness and respect is important. Among the wonderful things about running this ranch are the people we get to meet. Folks from Virginia, from Maryland, Rhode Island, New Jersey, Arizona, New Mexico, Michigan, folks we would never meet any other way, have now joined our circle of friends. We are honored by the love and respect they and our animals give us. We aim to live up to their expectations. And we also aim to live by two axioms you might have heard of: One, that the outside of a horse is good for the inside of a human, and two, we hope to be as admirable as our dogs think we are.